When you are selecting a new wide plank floor, you have to make many decisions. What type of wood floor do I want? What grade and style? What color? And then you still have to decide if you want prefinished wood flooring or unfinished wood flooring. Before you make this decision it is good to be informed because the finish you choose for your floor will determine how well protected it is and what your cleaning and maintenance routine will be down the road. So today we will discuss the benefits and disadvantages of prefinished wood flooring and unfinished wood flooring to help you determine which one is right for you. No matter what your reason for wanting to finish your floor on site, there are things to be aware of when taking this approach. When you site finish a floor you want to expect your job site to be down for several days or weeks, depending on how big your job is and the nature of the finish that you have chosen. You do not want anyone else, but your finisher working in your home during this time. You need to keep the floor as clean as possible. Have all your heating, air conditioning or other central air systems installed and operating before, during and after to support the most natural drying process. Your finisher will apply 1-2 coats of stain depending on the look you want to create, then 3-5 coats of finish/sealer, depending on the finish you have chosen. Generally speaking you can do 1 coat a day but it depends on the size of your project and the application method being used. The person staining the floor is going to play a huge role in the final outcome of the finish. The installer should make several large samples of flooring for your approval. Keep in mind that a small 12×12 sample is not going to represent 1000 square feet, so keep an open mind that there will be some variation in the finished floor. What are the environmental conditions during the finish application – if its humid stain can dry slowly, if its cold or dry air the stain dries quickly – which isn’t always a good thing. When you see prefinished flooring like this Wide Plank Walnut floor in a home designed by Tom Murdough Designs , you know prefinished flooring has come a long way from its introduction in the 1940′-s and ’50’s when prefinished wood flooring first emerged into the market in the form of 9″x9″ laminated blocks with a wax finish (that needed constant maintenance). The decision to finish your floors on site or in advance will really depend on what type of look you want to create. But let’s look at the general pro’s and con’s of each. There are some great advantages to having your floors finished in advance. Don’t worry about what the floor will look like after the finishing process, you already know when the flooring arrives. You don’t have the shut down your job site to finish your floors. You don’t need to hire a custom finisher to finish your floors, just a good craftsman to install them. This also makes it easier for DIY-ers. If you are considering a Prefinished floor please keep in mind that not all Prefinished flooring is created equal. In fact, a majority of prefinished floors are mass produced and finished with Aluminum Oxide. One of the biggest misconceptions is that Aluminum Oxide is the hardest finish, and therefore it must be the best, as many of these floors have a 25-50 year warranty. Unfortunately, those warranties don’t really protect against the floor getting scratches and scuff marks, which will cause it to become very unattractive over time. What you also don’t hear is that very few of these floors can be touched up over the years. So when you are tired of your floors looking unattractive you either deal with the diminished appearance or suffer the high cost of replacement. 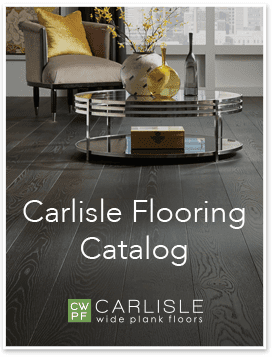 There are some floors that are NOT finished with Aluminum Oxide, for example read more about the Carlisle Custom Coat Process – all the convenience of prefinished with the beauty, durability and ease of maintenance of a site finished floor. No matter what finish you are using, and what finish preference you decide on, this is an important decision. Take the time to look at samples, and understand the advantages of the products you are considering. Most importantly understand that one small sample will not represent an entire floor, just use it as a guide. Find the right flooring company who can walk you through your options, explain their finish choices and provide you with the best solutions. Then make sure you work with an installer who worries about quality not quantity, and will take the time to help you achieve your vision. 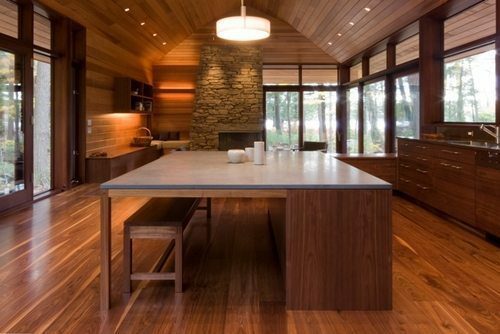 If you are looking for more finish ideas contact us to speak to a Wide Plank Specialist.